Every star, planet, and moon in the universe has its own weather patterns. Planets such as Jupiter have storms that rage for years. Massive dust storms on Mars, methane rain, lava flowing from the belly of ice planets, winds in excess of thousands of Km. per second – nothing unusual about this weather report. Being an avid space weather person I’ve learned to watch the solar wind. My faithful watchdog spaceweather.com updates it every 10 minutes. Most people know about sunspots, how about coronal holes? 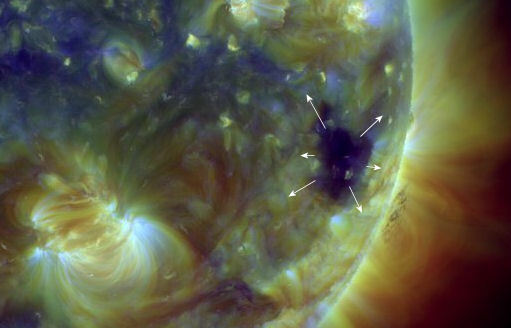 Think of sun spots as Krakatoa and coronal holes as Hurricane Sandy. A coronal hole happens when the sun’s magnetic field parts, allowing solar wind to escape. Yesterday the sun did just that. Solar wind is expected to impact Earth’s magnetic field tomorrow. Watch for vibrant auroras. Currently solar wind is blowing at an unimpressive 281 Km/sec. The wind from the coronal hole rupture will still impact our atmosphere.